Whether they've been naughty or nice matters not, as the more than US$1 billion pet toy industry has everything from the whimsical to practical to keep Fluffy and Spot occupied and caretakers entertained. 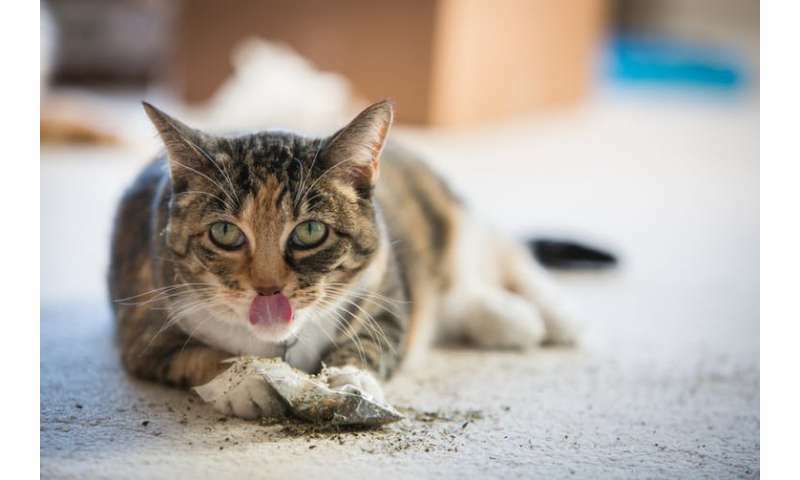 Many of the go-to items for cats contain catnip. This herb, which goes by the botanical name of Nepeta cataria, induces changes in cat behavior. In my view, it's worth considering whether giving a mood-altering substance to a pet is ethical. About 30 percent do not respond at all – which means 70 percent do – and it doesn't have an impact on kittens until they are about 6 months old, the time they attain sexual maturity. When under the influence, some cats roll around, salivate, and at times, fight with other cats. It is not clear if there are any medicinal benefits. Cat owners often laugh at this behavior of their feline friends as being "high." Philosopher Peter Singer, calls for "equal consideration of interests." Singer argues that we should not use our species as a measure of the worth or abilities of others, or their worthiness of ethical consideration. Other philosophers too have argued that simply because dogs or other animals don't have the same vocal structure as humans doesn't mean they should be treated with less compassion. Furthermore, humans share many traits – empathy, ability to communicate, eating habits, sociability – with other species. For example, the capacity to love one's young, the need to have food, water and to spend time with others of one's own species are not exclusively human traits. According to philosopher Julia Tanner, "It would be arbitrary to deny animals with similar capacities a similar level of moral consideration." On Reddit, for example, one person commented, "think of it as your cat going out for a few beers after work." To that, another reader from an Alcoholics Anonymous family responded, asked whether it was ethical to give someone a drug in an otherwise substance-free home. I asked the nonprofit People for the Ethical Treatment of Animals where they stand on this issue. Media Officer Sophia Charchuk responded: "PETA is all for treating cat companions to reasonable amounts of high-quality catnip – and for keeping them indoors, where they'll be safe from cars, contagious diseases, predators, and cruel humans and able to enjoy toys (including those filled with catnip) for years to come." However, my point here is not only about whether cats feel pleasure or pain. It's about taking responsibility for our actions towards our pets and giving them the same moral consideration as we do to humans. This has an impact on how we view animals. I agree with scholars who have pointed out that we need to view animals as subjects of their own lives rather than objects in ours. I believe we need to reconsider the ethics of "catnipping" them. Mammals like to alter our consciousness, by many means, from exercise, to meditation, to cannabis. There is plenty of video footage of bears, monkeys, etc, finding natural means to get high, and doing it regularly, for the sake of it. Cats too, they do like catnip, it is not forced down their throats. People like Michael Pollan, who grows catnip for his cats, had observed the cats getting into the areas where the catnip plants grow. If catnip creates a little tiny damage in the cats´ brain, it is ok, cats do not develop scientific theory, neither create high tech. Being boring and making life boring for others is a sinful vice, many people like to be boring, like the author of this boring spreading piece.... or like the boring "very stable genious"